It is a growing trend in the business and construction world to restore buildings and signs to their original grandeur. 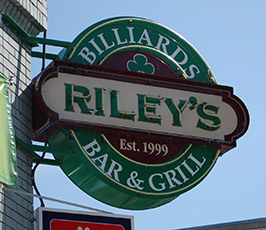 Often what occurs is a historic building has pictures of its original signage from the early 1900's and the owner wishes to replicate the style of the original sign in the new sign. We have an in-house advisor who can help guide you through potential State and Federal requirements when dealing with historic signage or replicated historic signage. State Historic Preservation Office (SHPO) recognizes anything 50 years old or older to be "of historic nature." SHPO also requires that "historic" buildings and their signage be dealt with delicately. It is often not as simple as remove the old sign and install a new sign. Often building owners will need to create proposals and drawings to show new signage intent with a full understanding of the era of time that the sign is to display. This is why we strongly encourage clients who find themselves in situations of new signage on historic buildings to contact our office and let us help guide you through the design process.